Providing you the best range of e rickshaw battery, 48v/ 12amp smps e-rickshaw battery charger and 48v/ 8amp smps e-rickshaw battery charger with effective & timely delivery. Siyachi E-Rickshaw battery has been specially developed in India for eco friendly E-Rickshaws after in-depth market research. Its unique features ensure good performance and satisfactory long life. These batteries are sold in the market since March 2013. Bottom lock technology that locks the lower part of the battery and increases life cycle. Advanced technology ensures deep cycling reliability, quick charge ability with high performance and long life. Alloy system optimized for deep discharge and low maintenance operation. Deep Discharge Ability - Plates have unique chemicals for deep discharge. Electrolyte Additives -Special chemicals are added to the electrolyte for better charge acceptance of the plates. Lug type terminals and fasteners for easy connection. E-Rickshaw runs only on battery. 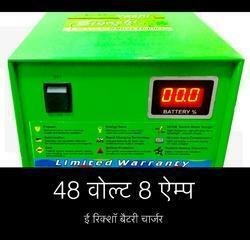 The way a motorcycle or car runs on petrol, E-Rickshaw runs only on battery. The more ampere capacity a battery has, the E-Rickshaw will run longer. When E-Rickshaw driver drives E-Rickshaw, the battery gets discharged and the volts go down. The more he drives E-Rickshaw, the more the volts of the battery go down. The volts of the battery go down to 10.5 volts or 10 volts or sometimes even upto 8 volts. This is called deep discharge. When a battery is deep discharged continuously either the battery will not get charged or the battery will lose capacity. That means the battery will run for less time. Use SIYACHI E-Rickshaw battery. SIYACHIE-Rickshaw battery has plates that are made of Deep Cycle Plate Chemicals. That means SIYACHI E-Rickshaw battery can be deep discharged without losing capacity. That means SIYACHIE-Rickshaw battery can be deep discharged and still it will maintain effective capacity for many months. When rickshaw driver drives E-Rickshaw, the battery gets discharged. After driving the whole day the battery gets deep discharged. As the battery is run in discharged condition the plates get sulfated. Sulfation accumulates on the plates. In the evening when the battery is charged, sulfation from the plates leave the plates and get mixed in the electrolyte. This charging process clears the plates of sulfation and the battery works normally. This process goes on and on every day. But after few days, some parts of the plates are unable to get cleared of sulfation and sulfation stays put on the plates. When the plates get sulfated with sulfation, charge acceptance of the battery goes down. Capacity goes down. Battery runs for less time. That means when the charge acceptance of the plates goes down, the battery runs for less time. I have heard that big battery companies use electrolyte additives in E-Rickshaw battery to increase charge acceptance of the plates. How do they work? To increase the life of the battery by increasing the charge acceptance of the plates, SIYACHI E-Rickshaw battery uses T15R powder. By using T15R powder in SIYACHI E-Rickshaw battery the charge acceptance of the plates increases and so does its cycle life. Smart Charger Helps Prevent Sulfation and Excessive Gassing. How a lead acid battery is charged can greatly improve battery performance and life span. To support this, battery charging technology has evolved with smart chargers. Multi stage smart charging technology automatically controls between under charging and over charging and significantly reduce the negative impact of these conditions. Correct application of the charging stages will maintain the battery at full charge, balancing between undercharging and overcharging, and helps prevent sulfation and excessive gassing. Multi stage is the safest and most effective method of charging eRickshaw batteries. The electrolyte solution has phases of accepting full charge. Multi state charging accommodates those phases and helps prevent sulfation and excessive gassing. BULK - Constant current provides the charge. The bulk stage charges battery to about 80% of the recharge and the charge current is held constant and the voltage increases. The charger will give the battery as much current as it will accept and not raise a wet battery over 55°C. ABSORPTION - The voltage is held constant for a controlled period so that the electrolyte solution absorbs the charge fully and completely. The most important part of the charge cycle is the equalization charge. Bulk charging only reaches the battery bank to 80% level, the absorption charge completes the charging cycle. OPTIMIZATION - A low charge is delivered to maintain the battery at full charge while not overcharging. In this stage the charger voltage is held constant while the current is reduced to less than 5% of the battery capacity. EQUALIZATION is essentially a controlled over charge. The peak voltage the charger attains at the end of the bulk Mode is equalization voltage. The electrolyte in a wet battery can stratify over time, if not cycled occasionally. In equalization, the voltage is brought up above typical peak charging voltage well into the gassing stage, and held for a fixed (but limited) period. This stirs up the chemistry in the entire battery, equalizing the strength of the electrolyte and knocking of any loose sulfation that maybe on the battery plates. 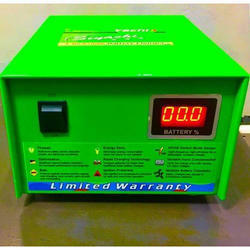 Sulfation is the main reason a significant portion of lead acid batteries don't attain their chemical life span.